I want to have long luxurious locks for our wedding. I imagine myself as one of those brides with thick waves down her back as she walks down the aisle. I know this is completely redonkulous, because I can never seem to grow my hair that long (and still have it be healthy. Also, because I got it cut in a long bob in February. I'm really not sure what was going on in my mind. I loved the cut, but immediately I started thinking about how I was going to wear it for the wedding. My hair is so slow to grow, and I knew that it would never be able to a. be long and wavy, or b. even be worn in a pretty updo. Pretty much since cutting my hair I have been growing it back out. As is the way. Biotin/Hair, Skin & Nail Supplements: I take the recommended dose per day. I usually buy whatever brand is on sale at the grocery store, or if I am at Target, they sometimes have vitamins on Cartwheel. I notice a huge difference in taking these... mostly because my eyebrows grow much faster. So random. Batiste Dry Shampoo: Deep/Dark Brown: I LOVE this dry shampoo. This is the first one that I have ever bought multiple bottles in a row, and I have tried many. It is colored brown, so it works great for brunettes, smells kind of coconut/musky, and does a great job keeping second day hair clean. I am washing my hair every other day, and this is very helpful to spread out those washings. Wide Toothed Comb: I use this to brush my hair when it's wet. I used to have a wet brush, but it got ruined actually brushing my hair. Stupid. To prevent damage, I quickly run a comb through my hair when it's wet, and let it air dry when possible. 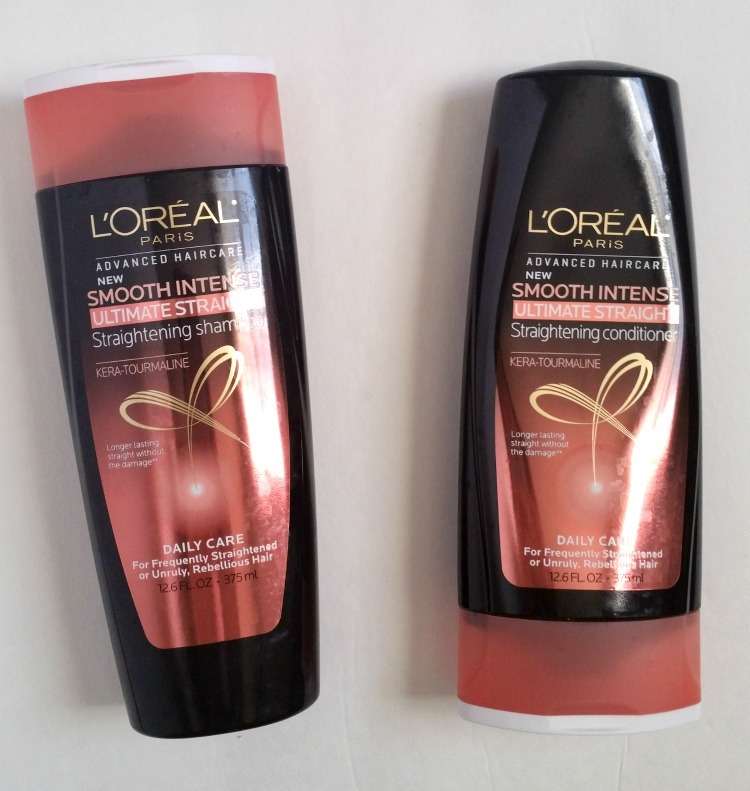 L'Oreal Paris Smooth Intense Shampoo and Conditioner: I have pretty straight hair, and these shampoos help keep it straight, and eliminate frizz, which is so important when the humidity is through the roof in the Virginia summer. 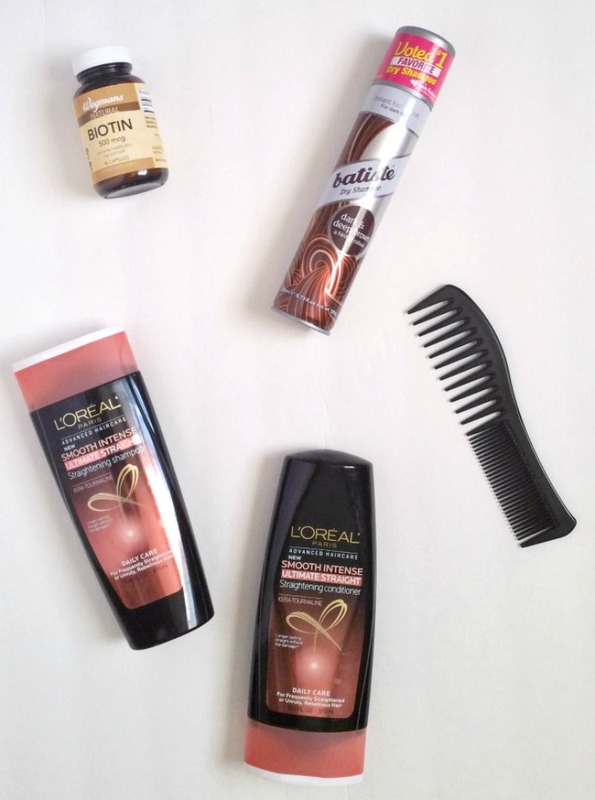 I am trying to stay away from heat tools, and when I use this shampoo and conditioner, I rarely need to pull out my flat iron. I can either let my hair air dry, or give it a quick blast of the blow dryer, and it will be soft, silky, and straight. So the journey to hair growth continues for another year! If you have any tips or tricks for growing your hair long and healthy, I would love to know them! Thank you for helping a sister out!! **I received these products complimentary from Influenster. All thoughts and opinions are 100% my own. I LOVE Batiste. I never heat style my hair. It's long, but so dead. I need a trim. I'm one of those who wavers...every year or two I chop all my hair off, have it for a while, vow to grow it out, grow it out, get sick of it....you get the picture. I'm dying to chop my hair but I refuse to before my wedding in October! I have been taking Biotin for years and it's always worked great for me. I wish I had other tips for ya. The only thing I suggest is doing regular hair masks to keep your hair healthy. It won't grow it any faster but it'll keep the hair from getting damaged. I'm the same. I go through phases of cutting it short and then growing it long. I should have never cut it as short as I did in January, knowing that we are getting married next summer, but I couldn't stand it any longer. Hopefully it will grow soon!! The best thing about the bastiste for me is that it is brown colored. I haven't tried the regular ones, but let me know if they work! I loved the cut, but I think longer hair will be more versatile. Let me know if the tips work for you! I'll have to try some hair masks! I've also heard folic acid works, but I'll have to do some more research on that one. Thanks for the tip!